These two White Pelicans flying low and in unison as they come in for a landing remind me of the U.S. Navy Blue Angels performing in a summer air show. As a spectator, I find myself entranced by the tight formation and flying agility. The stunning white pelicans found on Sanibel Island in February are skilled unison flyers. Having captured this moment in a photograph, I realized that the simple yet striking composition and blue/white color combination would translate well into an oil painting. So, I used my digital paint box to create my best rendering. What do you think? If I were a painter of an angel’s wings, I would imagine the ethereal wings of angels to resemble those of the Great White Egret in flight. As the Great White Egret takes flight, water droplets fall from his feet, and his outstretched wings appear at once delicate, strong and pure. 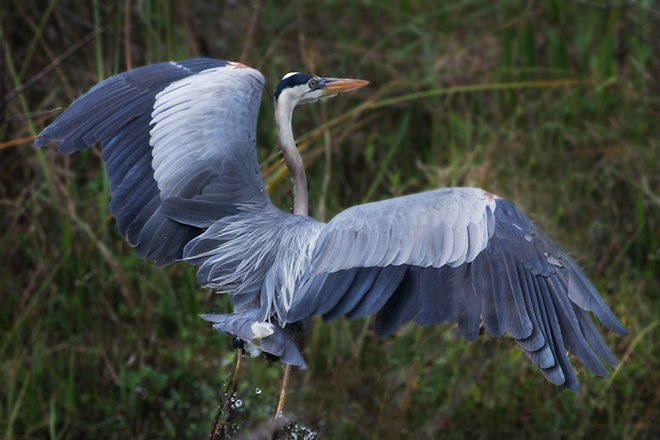 The blue heron is statuesque while standing motionless in the swamp. Instantly, he changes shape as he takes flight. Notice the water falling from the feet. Captured in Shark Valley, Everglades National Park, Florida with Nikon D800.